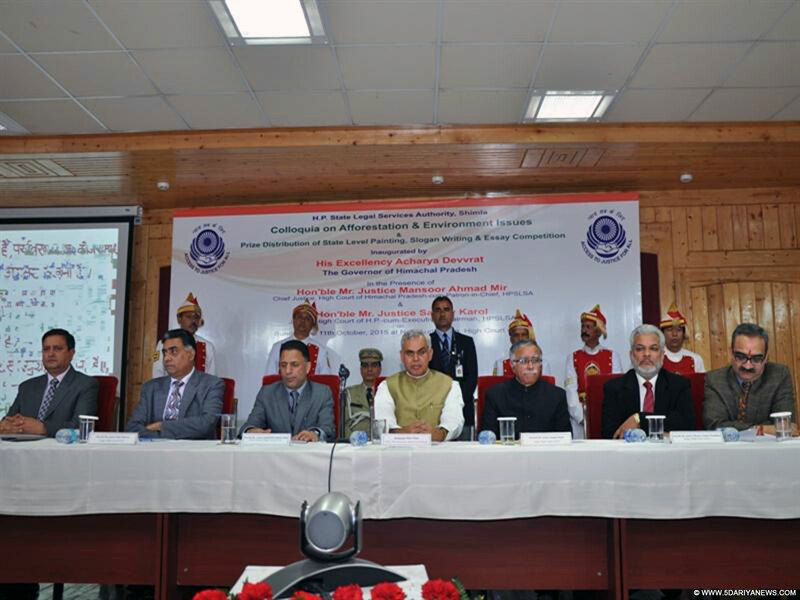 Governor Acharya Devvrat presiding over the Colloquia on Afforestation and Environmental Issues at Shimla on 11 Oct. 2015. Himachal Pradesh Governor Acharya Devvrat on Sunday said it was essential to involve children in creativity as inventions and discoveries were made by creative minds.Inaugurating a colloquia on afforestation and environmental issues organised by the Himachal Pradesh State Legal Services Authority here, the governor said developments in science were possible only when the children were encouraged to think and experiment freely. "All great philosophers, saints and teachers were great thinkers," he added.The governor said the responsibility of instilling good values in children and building a well-mannered and responsible young generation rested with all of them.He expressed concern that in present times human beings have become self-centred and were forgetting the concept of "Vasudhaiv Kutumbakam" or the world is one family. He stressed the need to revive this spirit, especially among children and the youth, so as to make future generation sensitive towards the poor, needy and compassionate towards suffering humanity.Himachal Pradesh High Court Chief Justice Mansoor Ahmed Mir stressed upon the importance of environmental protection. "Our ancient culture inspired us to have the highest reverence towards Mother Nature. The children could be the best ambassadors to spread this message across all sections of society," he said.He also complimented the state legal services authority for involving children of different schools in its environment protection awareness campaigns.Justice Mir said the legal community was contributing towards various social causes. It had planted more than 100,000 saplings across the state last year besides monitoring their survival, he added.